Obesity and your workforce – a ticking time bomb costing you money!! The Obesity Health Alliance have released some data to say that by 2035 56,000 people will develop cancer due to their weight!! By this date it is estimated that over 40 million adults will be overweight or obese as an employer you might be thinking…”yeah and, what’s that got to do with me?” Well quite a lot really as there is plenty of research out there to say that overweight & obese employees cost you money!! Two pieces of research from 2010 show the correlation between obesity, workplace health and productivity!! A study from Holland which looked at the role of lifestyle behaviours and obesity in a productive workforce. 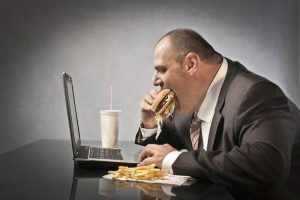 They found that more than 10% of sickness absence and higher levels of productivity loss at work could be attributed to lifestyle and obesity!! And a study from the states which sought to calculated the cost of obesity to business, yes I know this is skewed due to the US having no free health care and organisations contributing to health costs but it’s interesting to look at none the less, the reason I say this is that I believe that the cost associated with obesity are still present here in the UK it’s just we don’t see them on a bill when we get treated!! In this study they didn’t just look at health care costs but also absenteeism, presenteeism and loss of productivity. They found that as employees BMI (Body Mass Index) increased so did medical expenditure, absenteeism and presenteeism. There are a plethora of illnesses and diseases which are associated with being overweight and obese such as high blood pressure, liver disease, osteoarthritis or chronic kidney disease and lets not forget type 2 diabetes and chronic heart disease. You still might not think it’s got anything to do with you as an employer if you’re staff are overweight or obese but it does. These employees ARE costing you money!! These research studies suggest that overweight and obese employees have more time off sick, are more likely to suffer from presenteeism and also have reduced levels of productivity, can you afford not to think about this?!? If you have a healthy workforce, you have a happier workforce and a happier workforce is a more productive workforce. You must know yourself that when you are well you worry less about your health which in turn allows you to get on with your day and get things done!! So what can you do to help people to manage their weight and I know this is a sensitive issue and I’m not one for fat shaming as everyone has a right to be the size they want. The way I play it is about focusing on health and showing people how to make healthier choices when it comes to food and lifestyle decisions!! Encourage staff to have a lunch break!! Make water easily available (most people think they are hungry when in fact they are actually thirsty) – why not invest in some company branded water bottles?!? Celebrate staff who do sporting challenges and look at ways you can encourage staff to take up activity – what about doing the “workplace Olympics” to tie in with Rio 2016?